To chaliye shuru krte hai mobile phone ke On-Off Switch ko multimeter ko use krke kaise check krte hai. Yaha par diye ja rahe in simple steps se aap aasani se phone hardware repair me mobile phone me on-off, dead mobile phone related hardware faults solution me On-Off Switch ko check kar skte hai. 1. Multimeter ke Selector Rotatory Switch ko ghumate huye 20 Volt DC Current Mode par set kar rakhe. 2. Mobile phone ko current supply kare. Aap battery ya DC power supply se current supply kar skte hai. 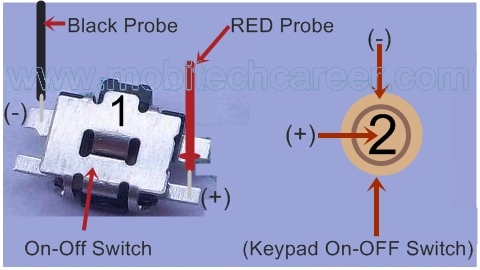 1) Ab mobile phone ke pcb circuit board par lage On-Off Switch ke pcb par solder hone wale left or right side ke legs par Black or Red probe ko rakhe. 2) Keypad mobile phone me Switch On-Off keypad tickly par andar or bahar wale gole par dono probes ko rakhe. 3. Probes lagane ke bad multimeter ki LCD display screen me 2.5 se 3.7 Volt DC Current ki value show hongi. Agar itni value show nahi hoti hai to On-Off Switch kharab hai. Notes: Kai bar On-Off Switch ki legs par dono probes ko lagane par 2.5-3.7V DC current show nahi hota hai. to aisa On-off switch se connect kisi small parts ke faulty ho jane ke karan hota hai. Jiski fault ko solve krna hum aage hardware repairing me sikhenge. Ab aap easily mobile phone ke On-Off Switch current Voltage ko multimeter se check krke fault ko pata kar skte hai. mobile phone repair course Hindi me sikhte rahiye. Please ho sake to aap is course ko apne facebook or whatsapp friends ke sath jarur share kare.